"We know that charity is essential for us to be saved in the kingdom of God. Moroni wrote, 'Except ye have charity ye can in nowise be saved in the kingdom of God' (Moroni 10:21; see also Ether 12:34). "We also know that charity is a gift bestowed upon us after all we can do. We must 'pray unto the Father with all the energy of heart, that [we] may be filled with this love, which he hath bestowed upon all who are true followers of his Son, Jesus Christ' (Moroni 7:48). "It seems to me that we receive the Holy Spirit best when we are focused on serving others. That is why we have the priesthood responsibility to serve for the Savior. 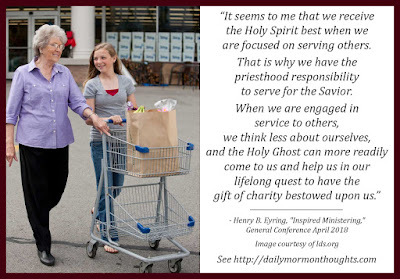 When we are engaged in service to others, we think less about ourselves, and the Holy Ghost can more readily come to us and help us in our lifelong quest to have the gift of charity bestowed upon us." 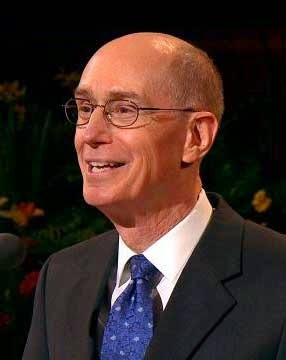 President Eyring teaches us that charity is not necessarily something we develop; it's a gift that comes to us as we serve and obey in faithfulness. That's an important concept, since we are told charity is essential for our salvation. One of the important steps to gaining this gift, after all we can do, is to pray to God "with all the energy of heart" seeking it. That is probably a request many of us are not acting on with enough diligence. As we all learn to minister more effectively, we will open our lives to greater influence from the Holy Ghost, and better qualify ourselves for that divine gift of charity.